"Let me tell you something, son. When you’re young, and you head out to wonderful, everything is fresh and bright as a brand-new penny, but before you get to wonderful you’re going to have to pass through all right. And when you get to all right, stop and take a good, long look, because that may be as far as you’re ever going to go.”It is the summer of 1948 when a handsome, charismatic stranger, Charlie Beale, recently back from the war in Europe, shows up in the town of Brownsburg, a sleepy village of a few hundred people, nestled in the Valley of Virginia. All he has with him are two suitcases: one contains his few possessions, including a fine set of butcher knives; the other is full of money. A lot of money.Finding work at the local butcher shop, Charlie befriends the owner and his family, including the owner’s son, Sam, who he is soon treating as though he were his own flesh and blood. And it is through the shop that Charlie gradually meets all the townsfolk, including Boaty Glass, Brownsburg’s wealthiest citizen, and most significantly, Boaty’s beautiful teenage bride, Sylvan.This last encounter sets in motion the events that give Goolrick’s powerful tale the stark, emotional impact that thrilled fans of his previous novel, A Reliable Wife. Charlie’s attraction to Sylvan Glass turns first to lust and then to a need to possess her, a need so basic it becomes an all-consuming passion that threatens to destroy everything and everyone in its path. 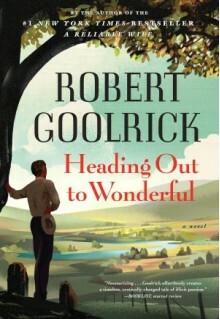 Told through the eyes of Sam, now an old man looking back on the events that changed his world forever, Heading Out to Wonderful is a suspenseful masterpiece, a haunting, heart-stopping novel of obsession and love gone terribly wrong in a place where once upon a time such things could happen.